Many people have a hard time affording the expensive hammocks out there. They begin searching for cheap hammocks online and are overwhelmed with the offerings. Not every hammock is made the same, and it is difficult to tell if they are looking into trash, or hidden gems. 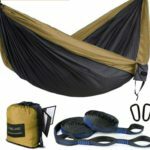 I have taken the time to compile a list of budget hammocks for both camping and hiking so you can easily find the best hammock for your budget right here. Whether you are interested in camping hammock reviews or backpacking hammock reviews, these should help you. There we go, quick list of what we have reviewed below. Looking for the reviews? Read below to find out how I came up with this list. Budget hammocks are a daunting thing to get into. You do not want to get a hammock that is subpar, will not protect you, or keep you comfortable while camping. Where can you save on some money, and increase in other places? It is hard to figure out. The most important things to look for is durability of material during extreme conditions, safety and durability, ease of set up, and proper size. If the hammock checks those boxes it will be a decent hammock on a budget. Farland hammocks are a quality designed hammock for a fraction of the cost. They are not a cheap hammock by anymeans, rather an inexpensive hammock. These hammocks are perfect for begginers to the hammock world who are concerned about the prices of name brand hammocks, and have a place in the loadout of an experienced hammock camping as a backup or loaner hammock. Farland offers 2 options. A lightweight nylon parachute hammock, which is ideal for backpacking, and day trips. They also have an outdoor camping hammockwhich is more suited for more rugged adventures. As a bonus you can check out their Lightweight Waterproof Mummy Sleeping Bag to keep you warm on those cold nights. The Farland lightweight nylon parachute hammock is a perfect hammock to get into hammock camping. It is inexpensive, easy to set up, and can hold up to 250 pounds. 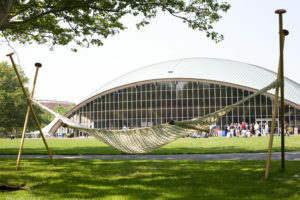 It is a spacious hammock, and can work as a double hammock for smaller individuals. It fits well into its compressing bag, and is easy to carry around on backpacking trips and as a spare or backup on more rugged trips. The Farland outdoor camping hammock is more rugged than the previous one in the list. 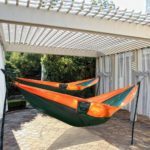 It comes in several different colors, and has size options for a single hammock or a double hammock. The hammock tree straps are rated at 500-800 pounds, so they are more than sturdy for the largest of campers. All of this in a compact 1.8 pound package! The inexpensive price makes it the perfect entry point hammock for those looking for a cheap hammock. Hukoer Hammocks are a premium product at a budget price. These hammocks are inexpensive and well made. 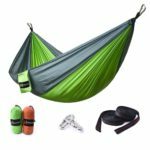 They offer a Double Camping Hammock with 3 color and gear variations. These hammocks are lightweight, but suprisingly resilient. Hukoer also offers a set of Hammock Tree Straps to supplement their hammocks with a higher quality tree strap solution. The Hukoer Hammock is a doulbe camping hammock with a 550 pound capacity. It was designed for backpacking and camping. it is lightweight, and comes with Hukoer's guarantee. The hammock weight 2.84 pounds, and is easy to carry. If you are looking for an entry level hammock take a look at the Hukoer. Augymer has one hammock offering available in the budget hammock category. The Augymer Double Portable Camping Hammock. This hammock is a lightweight hammock designed for for hiking and backpacking. It is made of parachute nylone, and with sturdy, strong construction. 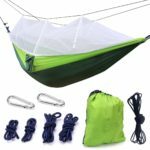 It is inexpensive, and an easy lightwiehgt hammock to throw in the back of your pack for a nice hammock camping trip. The Augymer Hammock is a double camping hammock with a capacity of 600 pounds. It is designed for 2 people, has plenty of extra room, and is easy to transport. It weighs just under 2 pounds, and folds up to under 6.5 inches long. For a budget hammock or a backup hammock, the Augymer Hammock is an excelent choice. Mersuii hammocks are on the upper end of the affordable hammocks available online. They have one offering, the Mersuii Double Camping Hammock. It is a lightweight parachute hammock designed for two people while backpacking or camping. It is lightweight, and easy to pack. 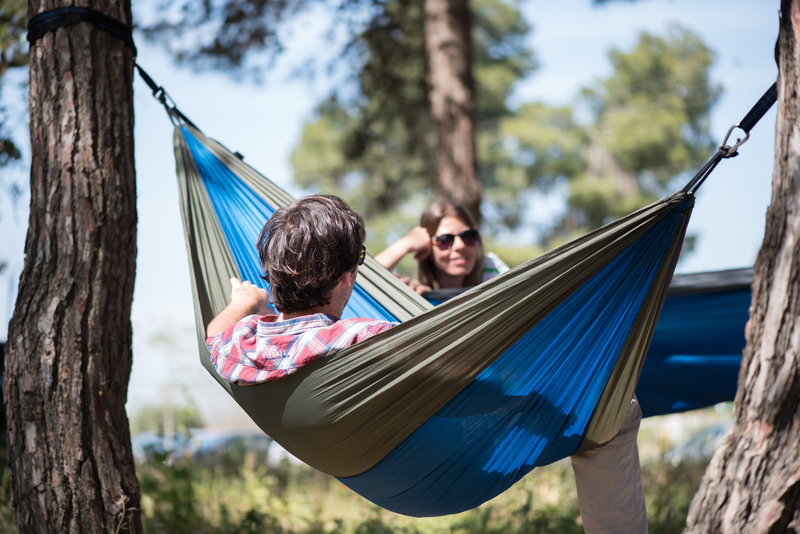 The Mersuii Hammock features a parachute nylone fabric for strength and durability. It can support 500 pounds, and offers a staggering 20 attachment points. It weighs in at a staggeringly low 1.1 pounds, and should be almost unnoticeable in anyone backpacking gear. Bring as your primary, and order a second one as a backup backpacking hammock. The Trofong Hammock is an ideal hammock when an enclosed hamping hammock is needed. The Trofong Double Hammock comes equiped with a built in mosquito net. Designed for more adventurous hiking locations the this hammock is bound to keep you safe and warm throughout the night. The Trofong Hammock is an all in one solution. It comes with everything, including a mosquito net, that you would need to start hammock camping. It is a double hammock, supporting two people, and up to 450 pounds total. It is lightweight, a total weight of 1.43 pounds. So it could very easily be packed into a backpackers pack without much additional weight concerns. This hammock is worth a look if you are interested in areas where a mosquito net is a must. The Richka Hammock is truly in a class of it's own in the inexpensive hammock category. It's main claim to fame is the 70d nylon which it uses. This nylon far outclasses the standard parachute nylon most other hammocks use in durability, and comfort. 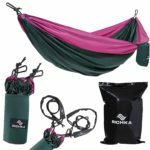 Richka only has one hammock on offer, the Richka Double Camping Hammock, which has a large weight limit, and supports 3 people. The Richka Hammock is strong and durable. It is a double hammock, but is large enough to support 3 people, and has a staggering 800 pound weight capacity. This hammock is one of the unsung gems of the hammock world. It is ideal for more rugged camping, and comes with everything you need to start hammock camping at a budget price. It weighs in at under 2 pounds, so it is still easy to transport. Make this one of your main hammocks for comfort and durability alone. The MalloMe Hammock is a perfect budget hammock for larger people, or those wanting more room. 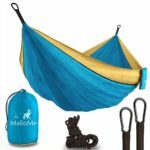 They offer the MalloMe XL Double Parachute Camping Hammock which can support a whopping 1000 pounds. There is no real concievable way to overload this hammock. The MalloMe Hammock is a doubvle camping hammock that when packed down only weighs 1 pound. It is well designed, and can support up to 1000 pounds. That is enough for 2 people, and plenty of gear. This hammock is perfect if you like room, and like to have your gear handy with you inside the hammock. The Gold Armour Hammock is a great budget friendly hammock. They offer a single hammock, Gold Armour Camping Hammock - XL Double Parachute Hammock. This hammock is an extra large size, and comfortable fits 2 people. It is light weight, and simple to set up. The Gold Armour Hammock is an amazing inexpensive camping hammock. It is a double hammock, large enough for two, and supports up to 500 pounds. It is 1.5 pounds when packed, so it is great for backpacking, hiking, or rugged hammock camping. Many people would benefit from a hammock like this as their first budget hammock. The Rusee Hammock is another premium rugged camping hammock, featuring a built in mosquito net. The Rusee Camping Hammock is lightweight, easy to put together, and keeps you safe in mosquito laden areas. TheRusee Hammock is a great durable budget hammock made for rugged camping. It weighs in at just under 1.5 pounds, and is large enough for 2 people. This is an excelent choice for the budget minded begginer. Are you planning a camping trip and want to try using a hammock instead of a tent? Tired of the endless information available on the web? Then you have come to the right place. Hammock camping has changed my life, and after this guide I hope it changes yours. Hammock camping is an amazing experience, but novice and expert alike have trouble finding the right products, and all the information available for them. I have gone over the best camping hammocks out there, and put together this list for you. I have already gone over the specifics of the hammocks, and can show you which hammock would be ideal for the type of camping you plan on doing. Size, material, and cost are all considerations. There you have it, a quick and dirty list of the best hammocks for camping. Read below for the reviews of these hammocks, and how I came up with this list! There are multiple things I take into consideration when I pick a hammock for any activity. The type of hammock, Material, Size, Maximum Weight, Hammock Tree Straps, Insulation, Accessories, and ease of use. So, let’s get right into it. Hammocks come in 3 main varieties, the one you choose depends on its intended use. Ultralight Hammocks are the lightest hammocks, and are made to be super compact. These are best for hiking trips, or hard to reach camping spots. Ultralight hammocks sacrifice comfort for weight reduction. Parachute Hammocks are usually made of durable and weather resistant nylon. These are ideal for extended outings where moisture is a concern. They breathe easily, and are still semi compact. These would be ideal for several nights in a row, and are a bit more comfortable than Ultralight Hammocks. Expedition Hammocks are made with the heaviest and most high end products. They are usually heavy weight, and made to withstand the worst that mother nature can throw at you. These hammocks are ideal for extended camping trips, and hammock camping in more extreme locations. Most hammocks are made of cotton or nylon composites. They both have different benefits. Nylon hammocks are your ultralight and parachute hammocks. They are much lighter and have decent wear protection, but don’t offer much in protection other than keeping you dry and keeping the wind off you. Cotton hammocks are bulkier, and look better, but they are more difficult to transport. Properly seasoned cotton will not leak, but will need to be air dried after the camping trip or mildew may become an issue. Hammocks come in many different sizes. The length and width affects load, and carrying capacity. A single hammock is thinner than a double hammock because it is meant for one person. A double hammock can accommodate two people, or be roomy for one person. Taller people should look for hammocks that are 8 feet in length or greater. The maximum weight of a hammock is important. A hammock can only support its maximum weight load. So, before hammock camping it is important to recognize your weight, your partners weight, and any gear you plan on taking into your hammock’s weight. Do not overload a hammock as even if it works the straps may give, or you may wake up smacking into the ground through a torn hammock. It is important that you understand the type of hammock tree straps your hammock has, and how to use them. Make sure at home you test the hammock suspension system, and all parts are included. More versatile suspension systems include more spots for anchoring attachments, and will provide better options for where to place your hammock. It may be worthwhile to purchase aftermarket hammock tree straps to provide the most versatility in your camping site. Planning is everything, so consider your site carefully before leaving unprepared. Insulation is an important factor when considering a hammock. Most nylon hammocks are great for warm months, but provide little protection during winter months. There are aftermarket blankets available that drape inside and outside your hammock to provide better insulation and warmth during winter months. Cotton hammocks on the other hand are often warmer by default. So it is worth checking out your hammock and planning your camping trip so you can have the proper level of insulation. Hammocks can come with several different accessories. A rainfly is probably what comes to mind right away. These go over your hammock, and attach to the ground and your anchor points. Keeping dry is important while hammock camping. If you plan on camping in a more humid area it may be worthwhile to look for or purchase a mosquito net. This will save you from being devoured by the annoying insects throughout the night, and in some more remote areas save you from serious disease. I include ease of use because some hammocks appear to have been made by evil mad scientist/engineers. Hammocks must be easy enough to set up that you will actually take them out with you when you go camping. Always test set up before you leave for your trip, and take notes of any difficulties you have. It is important to have a safe trip, but a frustration free trip is just as important. My favorite pick is the Hennessy Hammock Expedition Asym Classic. It features an integrated mosquito net and rainfly. It is an expedition hammock, so it is heavy. But it comes with premium materials, so it will last even the harshest mother nature has! This is a must buy. One of the best all-season hammocks for camping, the Clark NX-270 Four-Season Hammock Tent outperforms many other models. It is made to support wet and cold environments. This model is quiet expensive, but it is also the best hammock available out there. This is a one purchase and your done product! The Grand Trunk Double Parachute Nylon Hammock with Carabiners is an affordable hammock that is light, and built for 2 people. It is extra roomy if used alone. It comes with all the accessories you need, so purchase this and set it up all in one go! ENO hammocks are one of the iconic hammock brands. These are name brand hammocks, and you can expect the best from ENO. The Eno Eagles Nest Outfitters – DoubleNest Hammock is our favorite lightweight double hammock on the market. It is perfect for hiking to a remote campsite, and large enough for two. The Kammok Roo Hammock is a great choice for beginners. It is a lightweight hammock, and is easy to carry. It does not come with any additional accessories, but they can be added with ease. The Hammock Bliss Double – XL Portable Hammock is on our list because it is the easiest to use. It is super wide, and comes with 100 inches of cord to set it up. It’s ease of use comes with a smaller price tag, but you also lose additional features. Purchase rainfly’s separately for this one. 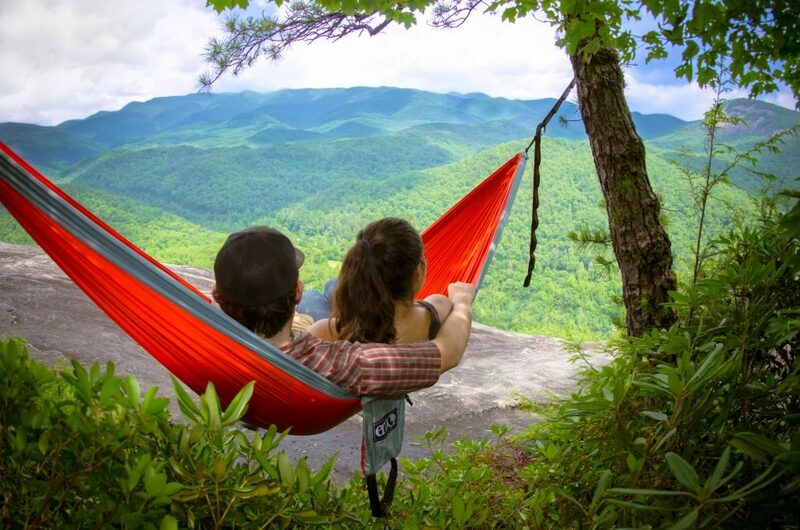 The versatile Lawson Hammock Blue Ridge is a hybrid hammock design. It can be used as a tent or a hammock for camping. It includes a pair of arch poles which raise the attached mosquito net to appear more tent like. This also comes with a detachable rainfly, and is a perfect option for multiple applications. The Grand Trunk Nano Hammock weighs and impressive 7 ounces, and is one of the best ultralight hammocks on the market. If your camping site is difficult to get to, or requires hiking in, then this is the hammock for you! The Lost Valley Premium Camping Hammock is great for beginners as it is a bundle that includes everything you need. Rainfly, Mosquito net, and hammock tree straps are included. It is easy to set up, and takes less than 3 minutes. The Grand Trunk Ultralight Hammock is another example of a perfect camping hammock for a beginner. It is lightweight and inexpensive, but not very durable. This would be a great hammock for established camping sites. There are many options, but the hammocks I have listed here are my best hammocks for camping. Don’t take my word for it, check out the other reviews for these hammocks. They are all great for their own uses, so be sure to read around, but you should be confident you purchased a great hammock if you choose one of these. Many people like to use hammocks, but are unsure of how to use them at home. Hammock stands are great if you want something to use your camping hammock on, but there are much more comfortable products out there specifically made for your home. Standalone hammock are usually heavy cotton hammocks with a stand. All in one units if you will. You do not need hammock tree straps to go with a stand alone hammock, in fact one purchase gets everything you need. hammocks will get wildly differing results. So I have gone through standalone hammocks and found my favorites. My decision is based solely on a seasonal at home hammock that you can leave up for hours on end. Portable Standalone Hammock This hammock is more portable than others, but it makes up for it with one of the most comfortable and versatile cotton hammocks made. This is a double hammock, so it is great for two people. Set up the stand inside or outside, and have a comfortable place to sleep for two. The hammock can be taken down and stored inside easily for stormy nights, or during the off season. Vivere Standalone Hammock Made of heavy duty cotton, and a sturdy steel stand, this double hammock is great for more permanent solutions, but is easy to take apart and store in the included carrying bag. 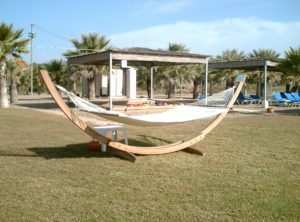 The hammock features a 9 foot long foot print, and it is plenty wide enough for 2 adults. It’s 450 pound capacity is sure to keep the material intact, even during the crazies of uses. Storage, durability, and all in one. You cant go wrong here. Algoma Rope Stand Alone Hammock If you live in a warmer client this hammock is for you! 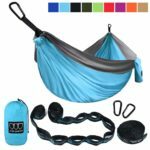 Featuring a rope hammock that can breathe, a hammock pad, a pillow, and the stand! This hammock is sure to impress. 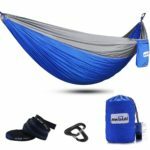 It is a single hammock, but it will make up for that with it’s breeze rope lower, and comfortable, breathable padded top. 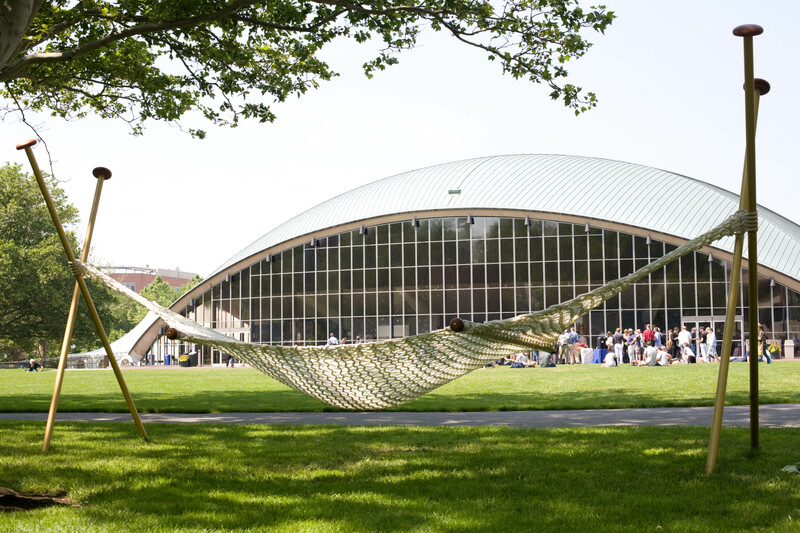 Relaxing in the sun is what this hammock was made for. Standalone Hammock Chair No hammock list would be complete without at least one hammock chair. This Stand Alone Hammock Chair features a nest design. It will hold 265 pouds, and is perfect for snuggling up with your favorite book. It is easy take down with a steel frame, and has a smaller footprint than the standard stand-alone hammock. On August 21st 2017 the first solar eclipse will be occurring, and be viewable throughout the United States. Many hotels are already booked in the path of totality as people scramble to see this once in a lifetime phenomenon. So, what is the best way to see the eclipse in the path of totality now? Camping of course! Most campgrounds that allow reservations are booked completely up, but there are plenty of first come first server, and rural camping spots that you can get to. I am not going to go over everyone in this article since the path of totality goes over many states, counties, and cities. The best way to find these rural sites is to look up Bureau of Land Management land along the path of totality. You can also look up state and county parks along the path as well. Once you find a spot it is time to plan your trip. Make sure you bring all your camping essentials, including your hammock. I feel a hammock is ideal for viewing the Solar Eclipse specifically. It will get you off the ground, looking up, and cradle you in a comfortable position. The alternative is looking straight up for several minutes, crooking your neck at an odd angle, and likely giving up on watching the whole thing. I do have a couple of specialty recommendations for your hammock though. 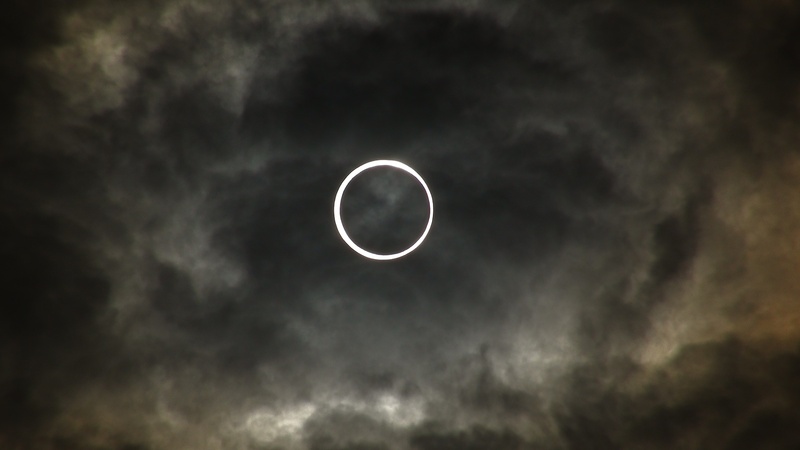 It is difficult to see through trees and shrubbery if you are looking at the solar eclipse. So, make sure you have long and sturdy hammock straps that will pull you away from the canopy above. I recommend the Eno Atlas Straps since they are 9 feet long each, and can support up to 400 pounds. The atlas straps also have 30 different anchor points. So, while you are trying to figure out a custom configuration to give yourself the best view of the solar eclipse you have many options available to suspend your hammock. These straps will also last for years to come, and would be a perfect addition to your standard hammock gear. For the hammock itself I would recommend the ENO DoubleNest Hammock This hammock is large enough for 2 people, but made to be extra comfortable for just one. It is easy to set up, and carries in a compression bag. Attaching it with the ENO Atlas Straps is a breeze as the products are developed for each other. The weight limit on this hammock is 400 pounds, and it comes with plenty of accessories to make sure you have the best hammock experience out there. Now that you have your hammock and accessories taken care of it is important that you consider viewing safety. It is still dangerous to look directly into the sun and you will need to take care to either make a punch card, or purchase some commemorative Eclipse Viewing Glasses. I have searched around and managed to find a set of glasses that comes with a commemorative poster. It comes in a 5 pack so get with your friends, and view in style! Eclipse Glasses. Here is the product. They are lightweight, inexpensive, collectible, and properly protective. These will protect your eyesight while allowing you to witness history! The next problem you need to overcome is your camera. I am sure you are going to be taking photos and possible video. But the sun will wash out your photos even during the Eclipse. So you need a filter that can allow your device to take a good photo. I found a Solar Filter Sheet available for cameras, telescopes, and binoculars. This is a custom solution. Using tape you attach this to your device. It will allow the camera to take photos without washing out. You need to make sure to tape all edges though. If you are using a phone or smaller device it is fine to cut the filter to size. This filter also allows you to view the sun safely through a telescope. Remember that any unfiltered viewing of the sun is dangerous to your eyes and can cause severe and permanent damage. You can attack this filter directly over the front of your telescope and it will work the same as the camera, it will filter out some of the light, allowing for safe viewing. The filter can be taped on, but again all edges must have tape to prevent light from entering from around the outside of the filter. Anyways those are the specialty items I could think of for experiencing the Solar Eclipse this coming August. Remember safety must come first when viewing the sun, but you can easily enjoy this rare phenomenon first hand if you follow the proper safety steps. So start planning now, and check out our other guides on hammocks, straps, and set ups so you are prepared prior to your trip. I wanted to get you guys more videos and information on the setup and take down of hammocks. Since ENO hammocks are some of the most popular hammocks on the market right now, I figured I would include a video specifically for them. This youtube video by GearTestTv shows how to use the Eno Atlas Suspension System to hang a hammock between two trees. It shows how to install the Eno hammock straps, and how to adjust them properly. The video then goes on to explain how to attach the Eno Hammock to the Eno Straps, and how to properly adjust and use the hammock. It then goes through how to properly take down, roll up, and store your Eno hammock. And there you have it folks, simple, straight forward, and easy to remember. Always make sure you know how to use your equipment before taking a trip by practicing at home. Learning how to install a hammock properly in the field is waiting for disaster. Murphy's law exists for a reason! Stay safe guys, and get out into nature! Hammocks are a great addition to any camping or hiking trip. They get you off the ground, provide you a more comfortable environment, and have a smaller footprint than traditional tent camping. Hammocks seem pretty straight forward, you strap it to two trees and enjoy! Unfortunately, there is more to it. Hammocks must bear the weight of the user, stand up to high winds, and stay in place while attached to the trees. So it is important that you install the hammock tree straps properly. The guys over at DFOHome have made a simple youtube guide on how to install hammock tree straps. I recommend you give the video a quick view before starting your hammock adventure. And there you have it. Now you can properly install your tree straps, and have confidence that your hammock will work properly while on your outdoor adventure. Stay safe, and Get Outdoors! When we think of hammocks, we usually imagine ourselves sleeping in it while stranded in the middle of a jungle. However, a lot of us want to experience the thrill of sleeping in hammocks within the safety of our homes or even the nearest neighborhood park. We also think that it is necessary to have two trees somewhere nearby and at a distance of at least seven feet from each other to be able to tie our hammock and comfortably sleep in it. You need not worry, though – with a hammock stand, you do not need to have a tree nearby and neither do you need to venture too far to sleep in a hammock. 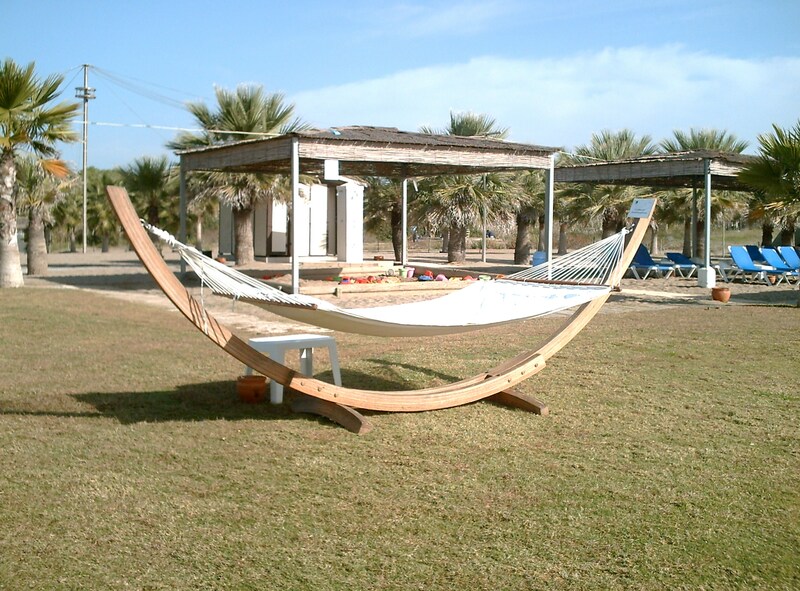 Hammock stands are usually made of sturdy wood or metal and can be assembled from smaller pieces. The wood ones are not nearly as portable as the metallic ones since they are heavier and bulkier than their metal counterparts. A hammock stand comes in various shapes and sizes and makes the process of sleeping in it extremely easy and quick. With normal hammocks, you have to tie up the hammock again and again in case it gets loose, but that isn't much of an issue with this one. Additionally, you can just push the hammock stand away if it is in your way, whereas in a hammock tied to a tree, you need to go through the tedious task of untying the hammock. All in all, the hammock stands comes in really handy if you are the type that likes to move hammocks around a lot. This hammock can even be brought indoors. It also looks more aesthetically appealing as compared to normal hammocks, so if you are in the mood for a change in the way you relax but don't want to make the effort to tie and untie your hammock, you can buy yourself a hammock stand. Hammocks are a great outdoor accessory. They let you experience nature while being strapped to trees, suspended from the ground. Sometimes it may be difficult to find a proper tree to suspend a hammock to. That is where a good hammock stand come into play. Hammock stands can be purchased as a standalone hammock suspension system, or as part as a bundled hammock with stand deal. These are the things to consider when purchasing a hammock with a stand or a hammock stand individually. if it’s a camping hammock, or an indoor hammock, comfort is paramount because without it, there is no difference between the hammock and a flat surface. A good hammock withstand is made from high quality material such as parachute nylon or cotton that is not only durable, but also comfortable to lie on. The weight of a hammock with stand plays a crucial role when it comes to the value of the entire unit. Stands are normally made from coated steel, resin steel or aluminum and can weigh as much as 35 pounds. Therefore, this is a factor that you need to consider. This is also one of the most important considerations before you purchase a hammock with stand. Since customers want to purchase hammock so that they can go with them on various outdoor events and activities, it becomes crucial to use them even when the weather is not welcoming, like for instance when it is raining or snowing. 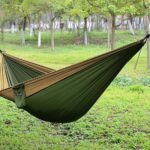 The best hammock with stand is made of grade A fabric that can withstand any kind of weather and doesn’t wear and tear easily, even after being used in bad weather conditions. The main work of a hammock with stand is not limited to act as a bed on camping expeditions alone, but it can also be used even at the comfort of your home, in your backyard, to relax and stare at the sun as it sets. Outdoor hammocks are well-made with material that can withstand harsh weather situations without mildewing or fading. The location that you select figures out the curve that your hammock will have. You ought to ensure that the trees aren't too close together if you are planning on hanging the unit on a tree. This is to avoid the hammock from scraping along the ground. You need to ensure that the trees aren't too far such that you have to extend the unit excessive therefore running the risk of ripping it. If the trees are far apart, you must include a rope or chain. You must think about going for hammocks with stands if you do not have trees on your property to hang the units. When hanging the hammock, this is another crucial aspect that you need to think about. If you apply a lot of force on the unit, you ought to ensure that you hang the hammock firmly. If you are the putting the hammock under little pressure, you must hang the unit loosely, on the other hand. While you need to make the unit loose or tight depending upon your choice, it is advised that you permit a 30-degree angle to avoid the unit from ripping. For you to be safe, you need to ensure that the suspended tent is safe and secure. The silver lining is that there are many ways of protecting the unit. Among the ways is utilizing Hammock Tree Straps. These straps feature a loop on one end and a metal ring on the other. There are numerous ways to hang a hammock from a tree. One is with eye screws which are screwed into the tree. (Cleaning up the drill bit and eye screws with alcohol might minimize the possibility of presenting infection to the within the tree.) Some specialists advise drilling directly through the tree and utilizing bolts with nuts on completion to ensure a protected install. If you have any questions about the viability of the trees and the technique you desire to use, speak with an arborist. Some hammock dealers bring tree straps so you can hang a hammock without destructive trees. These hold the hammock safely, and are simple to remove if you wish to move it around the lawn to follow the sun or the shade! If you plan on taking the hammock on getaways or outdoor camping journeys, they are likewise a great concept. When hanging hammocks in your property, these are some of the aspects that you need to think about. You need to hang it in an area where it will not trigger any diversion if you are planning of hanging your unit completely. You must likewise ensure that you hang it safely so that you do not fall while resting. With life as chaotic as it is today, yards all over the world are being changed into serene retreats. When making your very own personal haven, think about including a hanging hammock to finish your space. Absolutely nothing states convenience quite like a hanging hammock. Prospective buyers might be surprised to know there is a diverse choice of suspended tent on the market, with different products and different designs to pick from. When thinking about which hanging hammock will work best for you, here are some things to think about. polyester or cotton and both are really long lasting materials. Polyester will be a bit more weather condition resistant and will prevent the growth of mold to a greater degree, however, cotton is known for being more versatile and for that reason is frequently considered more comfy than polyester. It is necessary to keep in mind, nevertheless, that both will hold up against time effectively and either one will supply a comfy retreat. Of the rope hammocks, of specific note is the Mayan hammock. Historically, these hammocks are called presents from the gods. These hanging hammocks are perfect for taking a trip and are simple to establish. 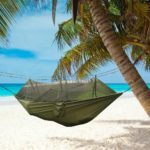 If your concept of a hammock is about swinging in the breeze, the Mayan hammock might be the best option for you as it is known for its swing aspect. While many people visualize rope hammocks, there is likewise a large range of fabric and canvas hanging hammocks to select from. These hammocks might not be quite as standard as a rope hammock, however, both fabric and canvas are comfy choices. The real advantage to selecting a hammock of the fabric or canvas range is a greater versatility in style. One popular kind of fabric hammock is the Brazilian hammock, which is likewise referred to as the banana hammock. This hammock is declared for the way it complies with the body, offering the most relaxing experiences to be found. With a lot of hammocks to select from, you make certain to find the ideal hammock to finish your outdoor retreat. A great camping tent serves you for a longer time. In basic, camping tents constructed of more powerful product (material, poles, and stitching) are priced greater. They will endure greater winds and much heavier rain. Then you might not require this level of strength and sturdiness for this reason you might decide for lighter variations that are always a deal. Once again if outdoor camping is among those things you do once in a year and you do not venture out into practically unidentified surface throughout the harshest of climate condition, then you are better-off sticking to a least costly camping tent. After that, you will be more knowledgeable and smarter to venture into more expensive options.